NOTE the NEW ROYAL PURPLE COLOR comes in KING & PRO sizes ONLY! The Q.E. Pad is available in: Pro, Single, Queen & King sizes. King & Pro sizes are available in Royal PURPLE as of November 2015. The Quantum Energy Pad (Q.E. Pad) is recommended for anyone who wants to sleep overnight on their BioMat. Why? 1. The Q. E. Pad has a functional mesh designed to reduce pressure points and to distribute the weight more evenly. This leads to a more pleasant sleeping experience with the BioMat. 2. The Q. E. Pad was specifically created to allow more air, negative ions and infrared light to 'flow through' than any other memory foam product. 3. 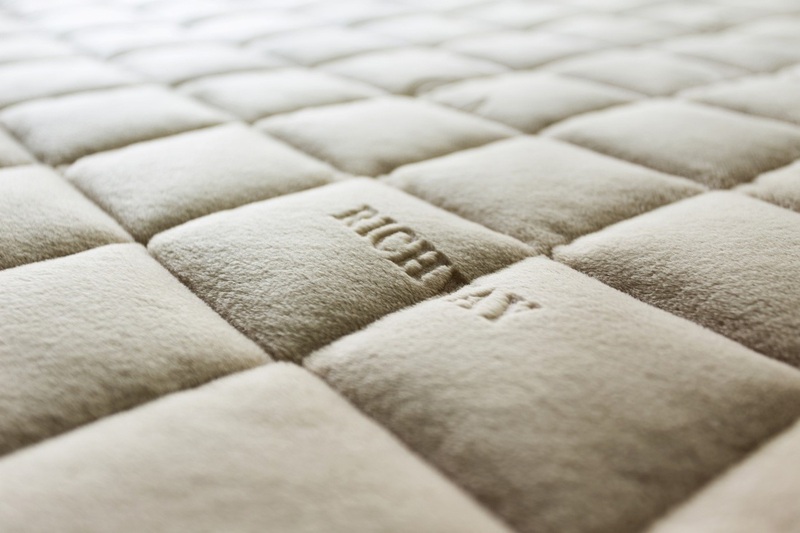 The Q. E. Pad produces the comfort of a memory foam layer without the off-gassing or other objectionable properties of memory foam toppers/mattresses/etc. 4. The Quantum Pad is also far superior to a 'snugfleece' brand cover that is sometimes paired with the BioMat. Snugfleece covers do have a soft texture, yet they have no functional ability to redistribute weight or deal with pressure points; so they have limited benefits for overnight sleeping. The Quantum Energy Pad (Q.E. Pad) is a new functional bedding accessory developed and manufactured by Richway International, Inc. and their partner "The Life Company". The Quantum Energy Pad, is a product composed of environmentally friendly raw materials such as organic energy compounds extracted from peach and grape seeds. These organic energy compounds are very beneficial to the human body’s biological vibration by balancing electrical charges at the cellular level. 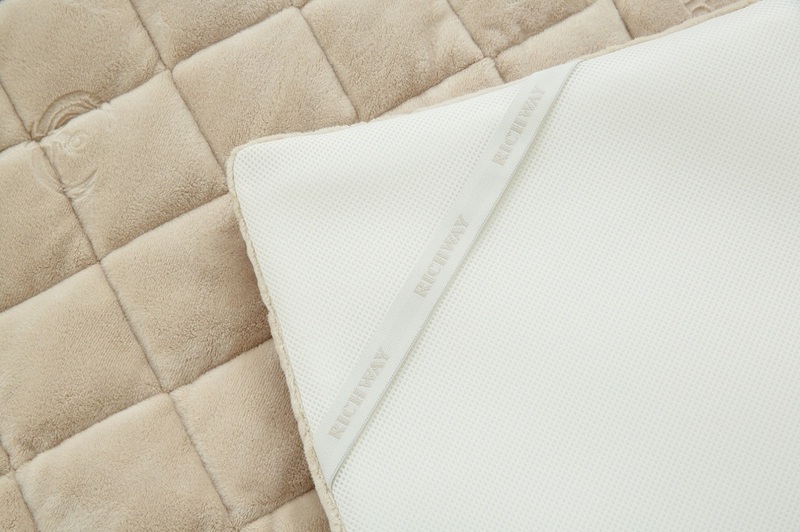 A perfect adjunct for the BioMat, adding comfort as well as its own therapeutic formula for rest & recuperation. Truly a win-win situation! Both the quantum energy layer and liquid Tourmaline layer maintain your health by promoting blood circulation through the use of Far Infrared Rays and enhancing resistance against harmful germs and bacteria which can contribute to various illnesses. The Q.E. Pad creates anions (1,654 pcc), also known as negative ions or “vitamins of the air”. This increases the body's resistance to illnesses. The Q.E. Pad has also been shown to dramatically reduce the presence of harmful bacteria, especially in the cases of pneumonia and staphylococcus. The pad’s strong antibiotic function reduces these bacteria by 99.9% at the surface of the Q.E. Pad. The super-fine hypoallergenic microfiber fabric aids in the prevention of heat loss, keeping your family healthy and free from allergic dyes used in most synthetic fabrics. The microfiber used on the QEP is superfine (dust mites cannot live on this superfine microfiber). This hypoallergenic microfiber aids in the prevention of heat loss, & is free from allergic dyes that are used in most synthetic fabrics. Its high density and durable 3D mesh material allows excellent air permeability. It also assists the passage of Far Infrared Rays when used with the BioMat. This is unlike other products that may actually hamper the flow of negative ions and/or anions. The 3D mesh evenly distributes your body weight and eliminates pressure points. The thickness of the pad makes sessions on the BioMat more comfortable while still allowing all the benefits of the BioMat to come through to the body (negative ions and Far Infrared Rays). The Life’s Quantum Energy Pad reduces Beta waves, known to be created in highly stressful situations; while also increasing Alpha waves, which create a state of relaxation, allowing fresh sleep and vitality. This is beneficial for everyone to sleep on with their BioMats, especially for busy professionals or test takers who need high levels of concentration. This theory was first used in the name of “Quantum Energy” by a German physicist, Max Planck (1858-1947). A healthy cell takes on negative electricity. Common cells function normally when the voltage is less than -15mv. Problems within a cell begin to arise when the voltage is more than -15mv. Particularly, the average voltage of a nerve cell is -70mv, but when it experiences pain, the voltage of the nerve cell increases to +30mv. "Quantum Energy" can be transmitted up to -90mv, so it can get rid of the pain signals from nerve cells, even in excess of +30mv. As shown above, Quantum Energy maintains the balance of electrons in cells, causing the voltage of the injured cells to return to normalcy. In addition, Quantum Energy helps heighten the energy field in the cell membrane. by using a special substance found in plant seeds. which include more than 18 types of specific substances. so they play a role in returning the voltage in the cell membrane to normalcy. alleviating the pain in the human body. which also just happen to emit powerful Far Infrared Light! *CAS Registry Numbers, also referred to as CAS Numbers, are unique numerical identifiers assigned by the Chemical Abstracts Service to every chemical substance described in the open scientific literature. **The Quantum Pad is less important for those who plan to use the BioMat only for short daytime use, or for those using it in a professional setting. In those cases, it is generally better to keep the body closer to the BioMat, for maximum infrared effect over a limited time. (The Quantum cover is about 1 inch thick, and may reduce the infrared transmission to a small extent). The exterior of the Quantum pad can be removed and machine washed and dried. King: 21.20 lbs / 78.74" x 70.86" x 1.57"
Queen: 17.5lbs / 78.74" x 59.06" x 1.57"
Professional: 10 lbs / 72.83" x 27.56" x 1.57"